The cat is asking why can't all dining rooms look this great? 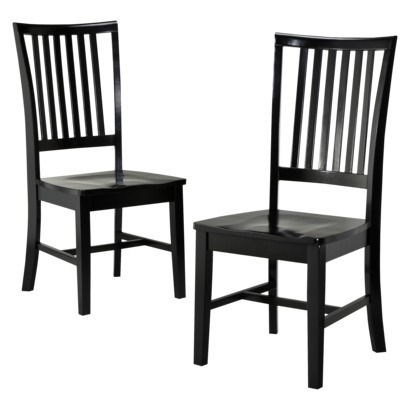 So, dining room chairs are super spendy. I mean, how much can a simple chair cost? Way too much! It's just a simple chair, right? Right? Well, let’s start at the beginning. When we first moved into the house, we had a simple round dining table. It fit four people and looked a little abused, but it worked. However, my husband and I really like to play board games. 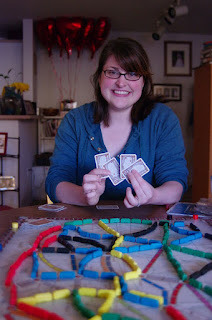 No, not Monopoly, but games like Settlers of Cattan, Ticket to Ride, and my husband’s favorite-Agricola. So, after we moved, one of our first goals was to purchase a great big new table. After much searching, we found this gorgeous simple solid wood table from Ikea in the “As-Is” department. I think its Oak, and we got this great table for $100 dollars down from around $300 I think. It has a nice leaf and is really solid and simple, exactly our style. We looked at matching chairs, but were not impressed with anything that we found. So we started the chair hunt. That’s when I found that chairs are crazy spendy. The husband and I really like a simple look, so we mistakenly thought that a simple chair would not be too spendy. One of the first styles that we kinda liked was this really simple Windsor Chair from Target. It’s a common style. 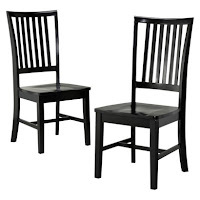 However at $68.99 for two, we would have spent $206.97 for chairs that we only use when guest come over. We felt that for that much money we should be getting something that we liked better and looked great. Now thats what I call style! We had two solid Oak chairs that we given to Erik when he was in college from his parents. The chairs were a great style, but not in great shape. My parents like to work with fixing up old furniture; in fact my mom has sold some furniture pieces that she and my dad fixed up. So for Christmas, we asked them to fix the old Oak chairs by doing some minor repair and stripping and restraining them. They very kindly obliged, and did an amazing job. The chairs look like brand new and are so sturdy. However, while those chairs were out visiting in my parents to be repaired it only left us with two chairs in the whole house. This was not a good situation, so my parents gave us two old bar wood bar chairs they had found in the dump in John Day, Oregon. And before you go thinking anything weird, there is no trash service in John Day where they live, so they have to take their trash to the dump. While they were there they saw a couple of these solid wood chairs and rather than let them go to waste, they grabbed them in hopes that they could find a use for them. I was really glad that they did. 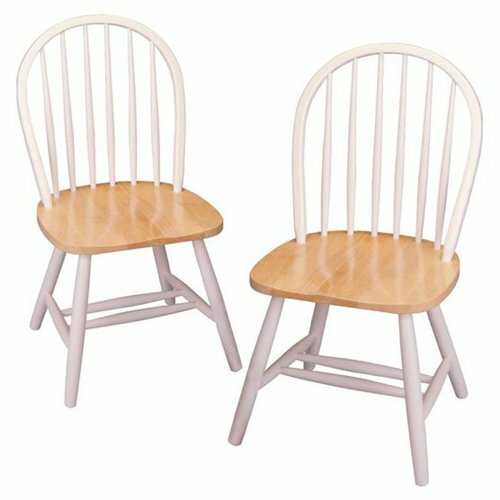 The chairs were in great shape and did not require any repair just some paint. So, now we are past the back story and onto the actually what she did part. 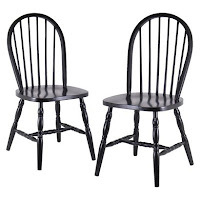 So I took our two old Windsor chairs and the two “new” black bar chairs and primed them with a spray paint primer. I primed two chairs per can of spray primer. They make primer for wood and for dark colors. It looks like this weird red/pink color. After I let them dry overnight, I painted them a dark chocolate brown. Again, I could spray paint two chairs per can of spray paint. I even painted the undersides. I used the chocolate brown color because in the living room, the fireplace is a chocolate brown, and this helps to tie the two rooms together. I only did one coat, and as you can see in the picture, it could use some touch-ups. When we painted them originally we had guest coming over the next day and needed chairs. You can’t tell in person, but with the camera flash the spots stand out. Guess I will go do those touch-ups when I get home tonight. I added matching chair seats that I got at Ikea for $5 each to make them all feel more like a matched set. Aside, from the one death chair, all the chairs look and work great and only cost us a whopping $36 dollars total ($16 for two cans of spray primer and two cans of spray paint, $20 for four chair seats).